With nine essential nutrients, including calcium, vitamin D and protein, dairy makes sense when it comes to healthful eating. Milk,cheese and yogurt provide nutrition and great taste while being a smart economical choice for today's families. Dollar for dollar, dairy is one of the most economical sources of nutrition available today. Dairy farmers' commitment to animal well being and fostering a healthy planet is just as strong as their commitment to producing safe,wholesome dairy products. On the dairy farm, we celebrate dairy every day by caring for our beautiful dairy cows and the land we call home but you will find that dairy farmers love to promote dairy products during June Dairy Month with involvement in a variety of activities. You can find a calendar list of June Dairy Month activities online at Midwest Dairy. 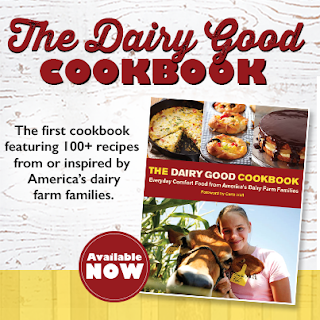 Dairy farmers are also celebrating the 100th anniversary of the dairy farmer-founded National Dairy Council and June dairy Month 2015 in a very special way with the introduction of The Dairy Good Cookbook! The Dairy Good Cookbook is more than a cookbook--it's a 'storybook' representing all U.S. dairy farmers that includes more than 100 recipes that celebrate the people and foods that make life dairy good. Beginning June 2, The Dairy Good Cookbook will appear in book stores like Amazon.com and BarnesAndNoble.com and other retail stores across the country. The book retails for $25 with a portion of the proceeds supporting the GENYOUth Foundation, a dairy farmer-endorsed charity that aims to nurture children's health and wellness in the school environment and surrounding community by raising funds, uniting partners with shared goals and empowering youth to create their own change. It's a perfect addition to any cook book collection or a gift for your favorite cook! year with all these great dairy farmer recipes! First of all congratulation for Dairy Champions Celebrate June Dairy Month, I have read your post. It is amazing and all the very best for your Dairy Champions. Thanks you so much for share this post.